Copenhagen Market (63-100 days) OP - Introduced in 1909. Compact plants bear 3-4 pound heads that resist cracking. Danish Ballhead (100 days) OP - Blue green 7-8 inch round heads with a short stem. Early Jersey Wakefield (60-75 days) - OP - 2-4 lb heads; Compact size and conical heads make this heirloom a great space-saving variety for smaller gardens. Introduced from the Isle of Jersey in the mid-1800ft.s, it was perfected by Peter Henderson, a truck gardener from New Jersey who bred its current properties. Matures in 70-80 days from seed and is resistant to yellows disease. Golden Acre (67 days) - OP - 6-7 inch round firm heads weigh in at around 3lbs. Greenboy (80 days) - Hybrid - Mid season 3lb green heads with solid white interior. Very tolerant of wet and dry conditions that produce stress on other varieties. Resistant FY. Good shipper. Late Flat Dutch (100 days) - OP - Huge 10-17lb firm heads resist cracking; This heirloom variety was a favorite with the early Dutch settlers. Mammoth Red Rock (90 Days) OP - Heirloom variety with 6lb slightly flattened, purple-red heads. Dependable producer. OS Cross (80 days) - Hybrid - F1 Hybrid All-American winner. Large uniform heads weighing 10 lbs or more. Good vigorous producer. Red Acre (80 days) - OP - Pretty 3 lb red heads are firm and solid. One of the most popular of the red cabbages. Stonehead (78 days) - Hybrid - 5-6lb heads are firm, blue green. Favorite variety of growers - produces very well, stores and ships well. Tropic Giant (80 days) - Hybrid - Huge 10-12lb heads are mid green. Heat tolerant and slow to bolt. Heads resist cracking. Good choice for summer planting or warm climates. Blues (57 days) - Hybrid - Napa type cabbage with crisp green 4-5 lb heads. Disease resistant and slow to bolt. Michihili (70 days) - OP - Firm narrow heads have dark green outer leaves and nearly white ribs. Does best in cooler temperatures; good fall or spring crop. Joi Choi (45 days) - Hybrid - A faster-growing and larger type than Pak Choi, it has dark green leaves up to 11 inches long. Mild flavor. Pak Choi (50 days) -OP -Non-heading leaf type with clusters of 12 inch wide celery-like stalks. Hardy in cool weather, grows fast and stands well. Cabbage is one of the oldest recorded vegetables used and one of the easiest vegetables to grow. A member of the Mustard family, Brassicaceae (or Cruciferae), it is related to mustard, broccoli, cauliflower, kale, brussel sprouts and kohlrabi. Cabbages vary in shape from round to elongated to flat. The leaves may be dark or light green, red or purple. Cabbage is divided into threee group: early, mid season and late cabbage. 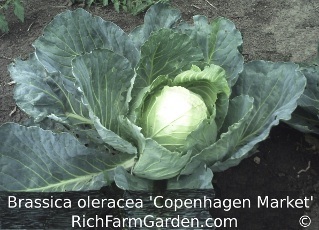 Cabbage grow best in cool climates and will grow in any well drained soil rich in humus. A light sandy soil that warms up quickly in the spring is best for early crops. Early season varieties are not best suited to storing, so use them for spring and early summer crops. Stick with mid and late season types for winter storage. To sow directly into the garden in full sun, wait until the spring weather has settled and danger of a severe freeze has passed. (see temperature graph below.) Work the soil so that it is fine. Working in humus, peat moss or leaf mold will give the plants a boost. Sow 1 seed every 6 inches in shallow drills in rows 24-36 inches apart. Cover lightly to a depth of 1/4 inch. Keep the seeds moist until they sprout, then thin seedlings to 18-24 inches apart. Water, cultivate and fertilize as above. HARVEST : Cut the heads when mature. Late varieties can be left in the garden until late fall, but should be harvested before a heavy freeze. Choose only firm heads and remove any injured leaves before storing. The heads can be wrapped in wax paper separately, hung by their stems or stored on shelves at about 32F at 95% humidity. The humble cabbage is an amazingly beneficial food. A rich source of vitamins B6, C and K. It is also a source of beneficial phytochemicals that may protect against stomach ulcer and colon cancers. There is great diversity in the cabbage varieties that we offer; which makes the general information provided only valuable as adjustable guidelines. This may also affect your seed planting and propagation strategies and the germination rates under your planting conditions may vary from the seed lot test results. The following soil temperature data is for cabbages in general. Temperatures are average daytime from planting to emergence. Percentage is average germination rate. Days is number of days to emergence.